What's a cubie? One of those large semi-transparent plastic containers - roughly cube shaped. 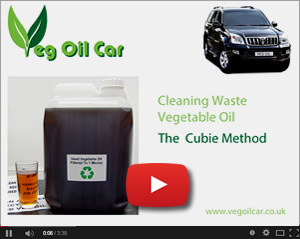 If you're not lucky enough to collect your Waste Vegetable Oil in a cubie, sorry, stick with one of the other systems I describe. But if you do, this page is for you. If you're lucy enough to be able to take advantage of this method, do check out the video for helpful tips and a handy animation. A large barrel / container, with an outlet (tap / faucet) a few inches above the bottom of the base. Three filter socks - one x 25 micron, one x 5 micron, one x 1 micron. A clean, empty container (a large bucket will do). A course filter medium - nothing too fine. Something that would strain tea or sieve flour would be perfect. Collect your WVO cubies until you have a reasonable quantity. Let them sit unmolested for a couple of weeks. Do NOT place them in sunlight and ideally keep them somewhere away from the elements. Let the WVO settle until you can clearly see a fatty layer at the bottom of the cubie. Collect containers. Let them sit a while and settle. 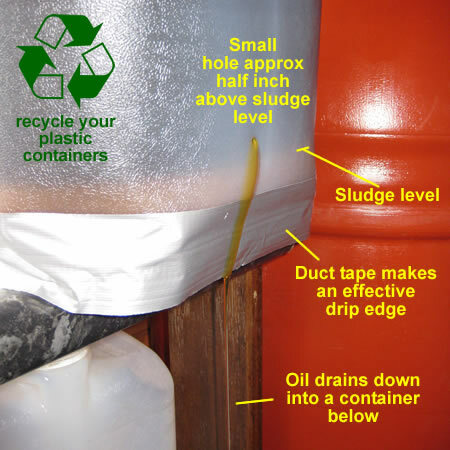 Then poke a small hole in the container half an inch above the sludge and drain out the cleaner stuff. 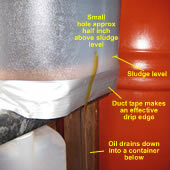 The oil will drip out rather than spurt out, Use duct tape to create a drip edge along the bottom of the container. Without agitating, place a Cubie on the edge of a sturdy table or bench. Poke a small hole an inch or so above the fatty debris and let the oil drip down through your sieve / mesh, into a clean container. The mesh should be fine enough to catch crumbs, bits, batter, etc, but not so fine as it slows the flow of oil. This may 3 or four minutes to set in motion. Now walk away - job done. That's it. Easy or what? You'll quickly adapt and learn a routine. The trick is NOT to rush the beginning. The temptation is to take your first container and pour it into your car. Never do that! Be patient, invest a few weeks at the beginning whilst still running on diesel, then with a good routine that takes less than five minutes each day you can always have good clean oil on standby. You might not believe me, but this method really does work. 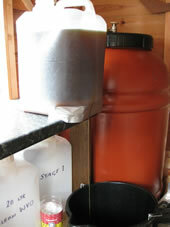 The fats, debris and water settle at the bottom of the Cubie. 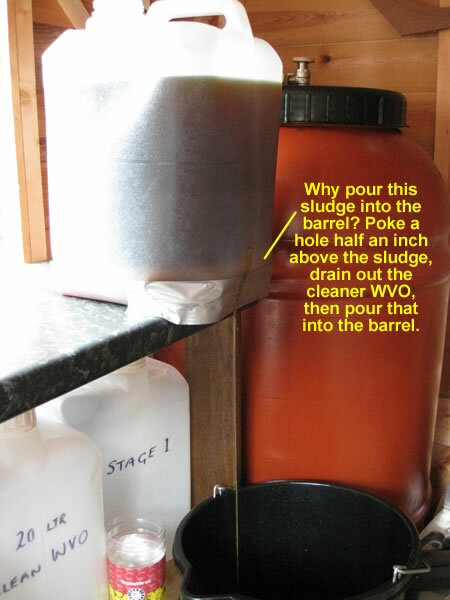 If you leave them there by not agitating the content, and if you remove the cleaner oil above and pass this through a quality filter sock, then you achieve finely filtered, fat, debris and water free oil.